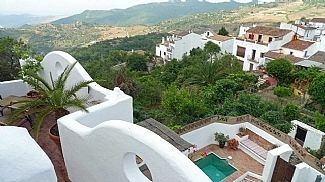 Located in the centre of Gaucin, a wonderful 'white village' in the heart of Andalucia. This stylish townhouse situated in a quiet backwater on the eastern edge of the village, close to the Roman Castle, yet only 3 minutes walk from all the local amenities, including shops, restaurants and bars. This spacious property totalling approximately 230 sqm over 4 floors, benefits from 3 bedrooms, 2 bathrooms, sitting room, dining room, kitchen and large living room and sun terrace on the first floor, which provides spectacular southerly views to Gibraltar Rock and the Rift Mountains of Morocco. There is also a small heated plunge pool (3.5m x 2.5m) and 1.5m deep, and a small private garden with an outside part covered terrace, table and 6 stairs, and a BBQ area. Newly installed dual heating and air conditioning units, as well as a wood burner and open fire (for those cosy winter evenings). The nearest beaches and golf courses are only 30 minutes away. Ground floor bathroom serving all bedrooms with a new walk in shower over, wc and wash hand basin and heated towel rail The second bath room is on the first floor and incorporates a separate shower cubicle, wc and wash hand basin. A large first floor living room, 2 sofas, flat screen TV (UK channels), DVD, and a separate sitting area with small bar and fridge. Ground floor sitting room with woodburner and TV and DVD. Dining room off the kitchen with table and chairs for 6 people. Good sized kitchen with gas hob, electric oven, microwave, dishwasher, fridge/freezer, pantry and a large selection of utensils. The washing machine is located in the ground floor bathroom. Table and seating area for up to 6 people. There are dozens of excellent golf courses with 45 minutes of Gaucin. One of the nearest is the famous Finca Cortisen between the village of Cassares and the coast and is only 30 minutes away. The Sotogrande area is only 40 mins away and includes some of Spain's best golf courses, including Valdarama, Sotoagrande, La Reserva and many more. Notes on accommodation: The owners have recently installed their own WiFi giving internet access throughout the house. Outside: The property benefits from a small garden with a private heated plunge pool (3.5m x 2.5m) and 1.5m deep. there a number of terraced areas suitable for BBQs and a shaded covered terrace with a table and 6 chairs, directly off the kitchen, convenient for outdoor dining during the balmy summer evenings. The dining room (where the BBQ is kept) also opens up onto the terrace. There is a selection of loungers, sun chairs and various permanent seating areas. Cleaning / Towels / Linen / Maid service: Towels and linen are included and with changed after each weekly letting. The house will also be cleaned after each weekly letting. The coast and beaches nearest to Gaucin located due south at Manilva/Sabinallas. This stretch of coastline is remarkably under developed, with very few high rise building and large wide sandy beaches. These beaches are only 30 minutes by car from Gaucin. Further afield and approximately 1-1.5 hours drive from Gaucin is the Atlantic historic town of Tarifa which is situated on a spectacular coastline and is the draw of surfers, wind surfers and kite surfers fom all over Europe and beyond. The nearest airport is Gibraltar which is approximately 45 minutes in a car from Gaucin. The larger airport in Malaga which provides a wider selection of flight choices through Easyjet, Jet2.com and Ryanair,is around 1 hour 20 minutes from Gaucin. Car hire is essential and this is easily organized at either of the above airports. It is recommended that a small to medium sized car is hired due to the very narrow streets in Gaucin and many of the other beautiful 'white villages in the vicinity. Gaucin is located approximately 25-30 kms from the main E15/A7 Motorway Toll Road. It is situated on the old Roman road which runs east-west and gives direct access to Ronda (35 kms/30 minutes) to the east. There are numerous other 'white villages' that are accessed directly off the Ronda road, all of which are worth visiting. Estepona and Marbella on the coast are 35 minutes and 45 minutes away from Gaucin respectively. Tarifa on the Atlantic coast is approx 1.25 hours away. Gaucin provides all the amenities you will require during your holiday; including several small supermarkets, a deli, butcher, a fishmongers in the town market (on certain days of the week), a couple of banks, numerous restaurants and tapas bars, as well as a number of arts and crafts type shops. All of these shops are within 5 minutes walk of the property. For the larger supermarket shop, Manilva on the coast is only 25 minutes away, where there is a Super Sol and Aldi Supermarket. There is also a Carrefour at Estepona, only 35-40 minutes from Gaucin. Booking Notes: 1. Choose your preferred holiday dates and check whether they are available be viewing the calendar. 2. Fill in registration form and send to Owner. Alternatively, scan and email it to below email. 3. £200 deposit is payable, on booking the holiday and the balance is payable 6 weeks from the date of arrival. 4. The bank details are on the registration form, so that the deposit monies can be transferred directly. Changeover Day: The preferred changeover day is Saturday, however we are preferred to be flexible, for stays of longer than a week or when in the low and mid seasons. Notes on prices: Less than 7 days rental will be considered outside of the High season. Please ask for details. The prices quoted do not include the use of the air-conditioning and allowing for the pool to be heated. If AC is required this will be charged at £50 per week, and the pool at £50 per week.